As a parent, your natural instinct is to protect your baby. A lot of companies will tug on your heartstrings as they advertise their diapers, wipes, and other baby essentials. Even I am a sucker for a catchy Huggies commercial or an Enfamil ad. But, many of these same companies are using harmful ingredients and needlessly exposing babies to toxins, allergens, and irritants. This is especially the case when it comes to baby wipes. Many mainstream baby wipes contain shockingly unhealthy ingredients. Unfortunately, brands like Pampers, Huggies, Burt’s Bees, and even Kirkland aren’t selective enough when it comes to choosing baby-safe ingredients for their baby wipes. Which Brands of Baby Wipes Should You Avoid? Baby wipes fall into the high-risk category because most brands of baby wipes contain harmful chemicals that any knowing parent wouldn’t want to expose their baby to. And certainly not directly on their skin, as it can cause allergic reactions and put them at risk for other health challenges. Like many other convenience-based products, baby wipes will contain some less-than-ideal ingredients; though companies are becoming more conscious about ingredients, some brands are worse than others. To avoid these risks, either use reusable cloth wipes or choose a safer brand of baby wipes and follow the guidelines below. 1) Avoid baby wipes with harmful ingredients. Choose natural and non-toxic baby wipes like the brands listed below. They get the job done without posing a health hazard. Keeping toxic brands out of your home is the first and most important thing you can do. 2) Use baby wipes less frequently. Use disposable wipes when you’re out of the house, but try to reduce your usage of them at home. Instead of wiping your baby’s bottom with every diaper change, only use them to wipe up poop. If you want to wipe your baby’s bottom after they have peed, consider using a soft, dry washcloth. 3) Wash your baby’s bottom instead of using baby wipes whenever reasonable. While baby wipes are essential to have at home and for on-the-go, you can avoid using them at home by washing your baby in the sink or even giving them a quick rinse in the tub. As long as you stick to the baby wipes on this list, you can rest assured that they contain safer ingredients and minimal preservatives. Let’s go over which chemicals to avoid in baby wipes and explore a few safer alternatives to mainstream baby wipes to help you choose the most natural baby wipes brand for your precious baby. While researching this article, I came across some mainstream brands that have used horrific ingredients in their products. When choosing a brand of baby wipes, it’s so important that you select a brand that contains as few ingredients as possible, uses no fragrance, and minimizes its use of synthetic preservatives. Some brands contain several essential oils, which are unnecessary and unsafe to use on babies. Polysorbate 20. This chemical is often treated with ethylene oxide which can be contaminated with potentially dangerous by-products known to cause skin reactions and allergies. Parabens. Parabens are preservatives known to cause allergic skin reactions and rashes. They are also linked to infertility as well as cancer and hormonal disruption. This applies to any ingredient ending in “paraben”, including isobutylparaben, propylparaben, butylparaben, ethylparaben, and methylparaben. Phenoxyethanol. While often used in place of parabens, phenoxyethanol is believed to be a safer synthetic preservative; however, when it comes to infant exposure, it has been associated with skin irritation such as eczema and affecting nervous system function. For these reasons, I prefer to avoid it in baby products whenever possible. Even a lot of sensitive brands of baby wipes contain this preservative, such as Aden & Anais, Pampers, and Huggies Natural Care. Sodium Benzoate. A synthetic preservative that is used in high concentrations in a lot of baby wipe formulas, sodium benzoate can cause organ system toxicity. When combined with citric acid, sodium benzoate can be carcinogenic. Fragrances. In my opinion, fragrance of any kind is unnecessary in baby wipes. Why do they need to be scented? And when companies go as far as to simply list “fragrance” on their ingredients list, they are taking advantage of a loophole in the law that enables them to avoid disclosing ingredients, including synthetic ingredients, parabens, and phthalates. This nondescript “fragrance” ingredient can contain chemicals that the company doesn’t need to disclose. When you see “fragrance” on any label, you should not use that product. This is because a loophole in the law allows companies to protect their “trade secrets” without actually disclosing what is in their fragrance. A product label that uses “fragrance” is always hiding something. Please avoid “fragrance” without exception – for products that you buy for your baby and yourself. Essential oils. Similarly, essential oils are powerful and potent. And I have questions about the purity and quality of most essential oils. A baby’s system is just developing and doesn’t need to be exposed to numerous essential oils. For the most part, I try to avoid essential oils around my kids, except under the direction of a professional. Baby products that integrate numerous essential oils are irresponsibly designed, in my opinion. Formaldehyde-releasing agents. Formaldehyde and formaldehyde-releasing agents have been found in baby wipes in recent years. Formaldehyde has been linked to cancer and several short-term health hazards such as skin irritation and allergic reactions. Propylene glycol and other petroleum-based ingredients. Petroleum-based wipe solutions need to be avoided because they can be contaminated and/or lead to skin irritations and other health concerns. And this is only a short list of troublesome ingredients found in popular disposable baby wipes. What’s also important to remember is that some of these potentially toxic chemicals are hidden ingredients that will not be clearly labeled on packages. Price. This is an important factor in choosing which brand of baby wipes you’ll use. Save money on baby wipes by joining Amazon Prime (use this link for a free 30-day trial) and adding your favorite brand of baby wipes to your monthly subscription. Target occasionally has good deals on Water Wipes and Honest Wipes. Thickness and packaging. Thin wipes won’t get the job done, so thickness and feel are an important factor. Similarly, flimsy packaging can make it difficult to remove a wipe from the container. Availability. Do you prefer to order baby wipes online, or would you like to be able to pick them up locally? Once you’ve committed to a brand of wipes, I recommend having them sent to you monthly through Amazon’s Subscribe & Save program. That way, you won’t have to worry about keeping baby wipes in stock at home (and you can always skip a delivery if needed). Your baby’s needs. Is your baby sensitive? Do they get diaper rashes? Do they have any specific allergies? Consider these needs when choosing the best baby wipes for your little one. Ingredients. As outlined above, the ingredients used in baby wipes are very important because the wipes are applied directly to your baby’s skin. Here are the best baby wipes based on ingredients, chemical safety, convenience, and overall feel and efficacy. 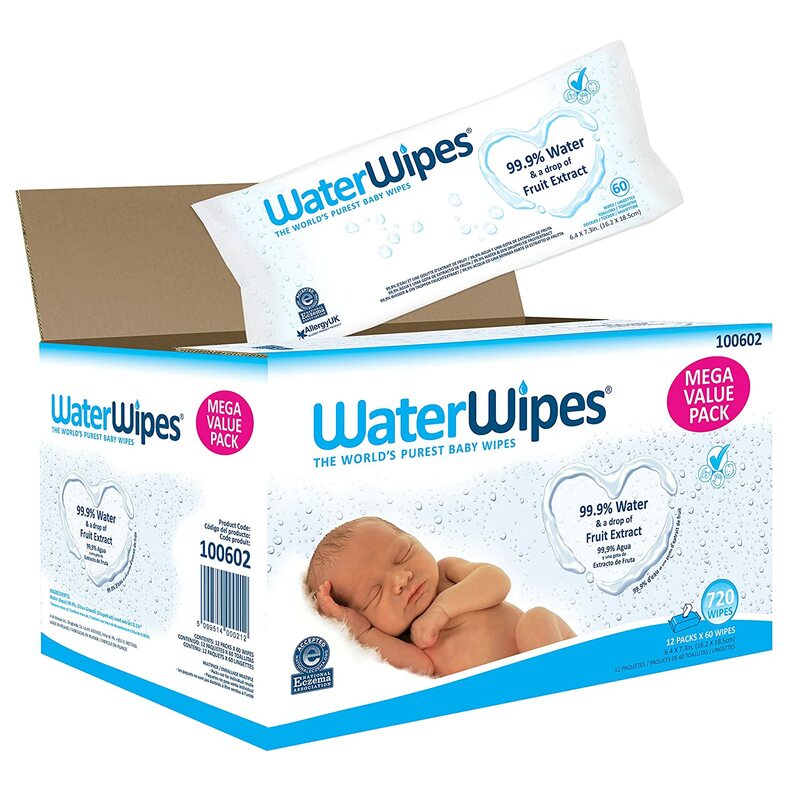 Water Wipes tops my list of the best non-toxic baby wipes because of their minimal ingredients. They have EWG’s best rating of 1, but it turns out that grapefruit seed extract can commonly contain contaminants such as methylparaben and triclosan, which are exactly the harmful chemicals we are trying to avoid. However, the manufacturer tests their grapefruit seed extract and has disclosed that it does contain a small amount of benzalkonium chloride – 0.002%. Given how clean the wipes are compared to other options available on the market, I am personally comfortable with this. But as with any wipes, use them sparingly, and preferably only when baby has pooped. It looks like the company is planning to reformulate and make the wipes biodegradable before 2025. I hope this happens sooner because I do not love that the wipes are made with polyester. Joonya Wipes Ingredients: Purified Water (reverse osmosis, electro deionization, and UV sterilization), Jojoba Oil, Silver Dihydrogen Citrate, Aloe Barbadensis Leaf Extract, Chamomilla Recutita (Matricaria) Flower Extract, Decyl Glucoside, Sodium Citrate, Citric Acid. Not rated on EWG. Joonya Baby Wipes are relatively new but very promising! I like that they use reverse osmosis and UV sterilized water. And I like their use of sodium citrate and silver dihydrogen citrate as preservatives because they have not been linked with any health or toxicity hazards. Joonya Wipes are made in China. But overall, the ingredients list looks clean and I think they are one of the better brands of non-toxic baby wipes. Yay for clean baby products. Honest Baby Wipes Ingredients: Water (Aqua), Glycerin, Chamomilla Recutita (Matricaria) Flower Extract, Cucumis Sativus (Cucumber) Fruit Extract, Glycyrrhiza Glabra (Licorice) Root Extract, Punica Granatum (Pomegranate) Extract, Peucedanum Ostruthium (Masterwort) Leaf Extract, Decyl Glucoside, Sodium Citrate, Citric Acid, Silver Citrate. EWG Safety Score: 1. While I’m not always a fan of Honest Company products, I use and recommend their non-toxic baby wipes. They have an EWG rating of 1, and their wipes are free of fragrances, alcohol, chlorine, phthalates, formaldehyde carriers, parabens, phenols, ammonium compounds, SLS, lanolin, and most allergens. The biggest drawbacks of Honest Wipes are that they are made in China and contain citric acid as a preservative. Synthetically sourced citric acid is cheap to produce but it may contain mold and mycotoxin residues. Citric acid is also in several products and in many processed foods. So, if you are using baby wipes minimally, your baby’s exposure will also likely be minimal. 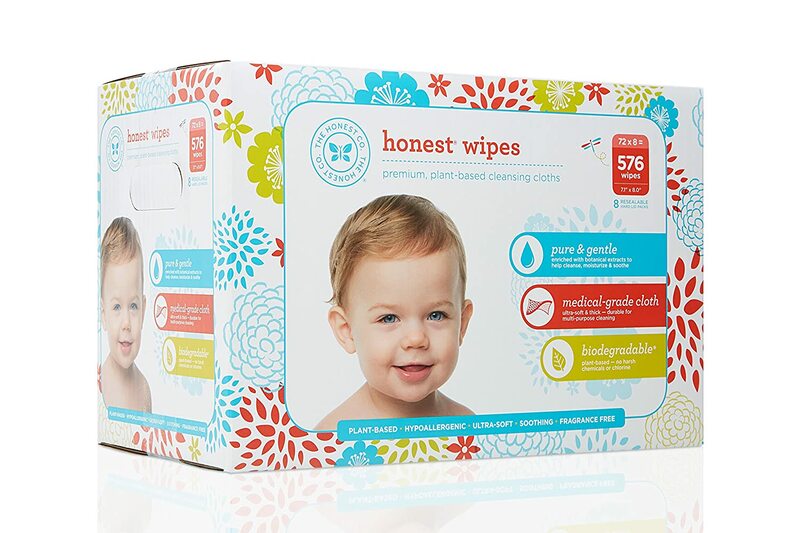 Honest Company diapers are on my list of the best non-toxic disposable diapers, so if you want to use their diapers and wipes together, I would suggest doing a diaper/wipes bundle subscription through the Honest Company website. These brands don’t meet my selection criteria, largely because they contain fragrances, unnecessary ingredients, or have preservatives listed as one of the main ingredients. With so many natural baby wipes on the market, there’s no reason to expose your baby to harsh chemicals by using other wipes that contain toxic ingredients. Make a better choice and choose a brand recommended above to find the best baby wipes for your baby.